If you are considering using pyranometers in your measurement application, there are many things you should know about them and how they work. 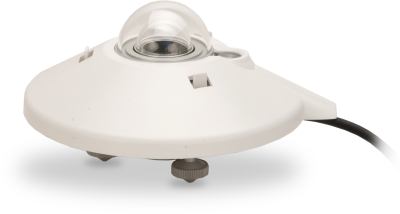 Having this information in hand will help ensure you select the type of pyranometer most suitable for the data you need for your application. Note: Because of the focus of this article, I will not be covering how to measure the individual direct solar or diffuse solar radiation, or discussing the different types of radiation in depth. 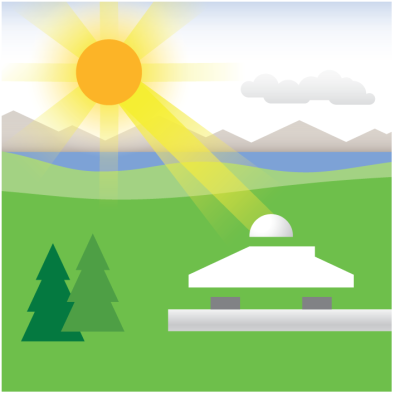 What is global solar radiation? Our sun outputs radiation over wavelengths from 0.15 to 4.0 µm, which is called the solar spectrum. The measurement of the sun’s radiation on the earth is referred to as global solar radiation. Sometimes called short-wave radiation, global solar radiation is both the direct and diffuse solar radiation received from the hemisphere above the plane of the pyranometer. It is difficult to find an environmental process on the earth that isn’t driven directly or indirectly by the sun’s energy. Therefore, it is likely that global solar radiation affects the process you are researching. Who measures global solar radiation and why? Solar energy to determine how efficiently solar panels are converting the sun’s energy into electricity and when the panels need to be cleaned. Sensors used for this purpose usually measure radiation in the plane of the solar panel array. What is a pyranometer, and what does it do? A pyranometer is a sensor that converts the global solar radiation it receives into an electrical signal that can be measured. Pyranometers measure a portion of the solar spectrum. As an example, the CMP21 Pyranometer measures wavelengths from 0.285 to 2.8 µm. A pyranometer does not respond to long-wave radiation. Instead, a pyrgeometer is used to measure long-wave radiation (4 to 100 µm). Pyranometers must also account for the angle of the solar radiation, which is referred to as the cosine response. For example, 1000 W/m2 received perpendicular to the sensor (that is, 0° from zenith) is measured as 1000 W/m2. However, 1000 W/m2 received at an angle 60° from zenith is measured as 500 W/m2. Pyranometers that have diffusors instead of glass domes require precise diffusors to provide the correct cosine response. What is the difference between a pyranometer, a net radiometer, and a pyrheliometer? 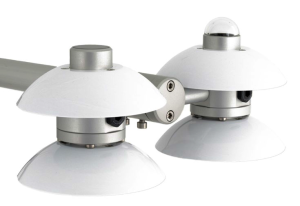 There are several different types of solar radiation sensors, including pyranometers, net radiometers, and pyrheliometers. A net radiometer measures incoming and outgoing short-wave radiation using two thermopile pyranometers, and it measures incoming and outgoing long-wave radiation using two pyrgeometers. These four measurements are frequently part of an energy budget. Energy budget assessments help us understand whether solar energy is being stored in the ground or lost from the ground, reflected, emitted back to space, or used to evaporate water. A pyrheliometer consists of a radiation-sensing element enclosed in a casing (collimation tube) that has a small aperture through which only the direct solar rays enter. Radiation bounced off a cloud or particle in the air does not make it through this small opening and collimation tube to the detector. 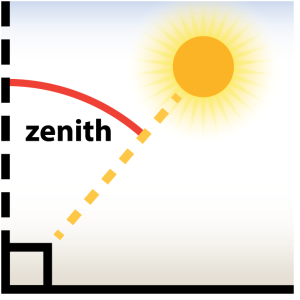 To make measurements all day, a pyrheliometer needs to be pointed directly at the sun using a solar tracker. How does a pyranometer measure global solar radiation? The most common types of pyranometers used for measuring global solar radiation are thermopiles and silicon photocells (Tanner, B. “Automated weather stations," 73-98). These pyranometer types are discussed below, along with their advantages and disadvantages. Tip: You will need to connect the pyranometer to a digital multimeter or data logger programmed to measure the mV dc voltage. If you are using a digital multimeter, you’ll need to convert the mV reading to W/m2 yourself. If you are using a data logger, you’ll need to set up the data logger to make the conversion. There are also pyranometers on the market where short-wave radiation (W/m2) is returned in digital format. This will require either a computer or data logger to read the serial data string (along with the appropriate interface data cable and communications software). Thermopile pyranometers use a series of thermoelectric junctions (multiple junctions of two dissimilar metals—thermocouple principle) to provide a signal of several µV/W/m2 proportional to the temperature difference between a black absorbing surface and a reference. The reference may be either a white reflective surface or the internal portion of the sensor base. The thermopile pyranometer’s black surface uniformly absorbs solar radiation across the solar spectrum. The solar spectrum is the range of wavelengths of the light given off by the sun. Blue, white, yellow, and red stars each have different temperatures and therefore different solar spectrums. Our yellow sun outputs radiation in wavelengths from 0.15 to 4.0 µm. The thermopile pyranometer accurately captures the sun’s global solar radiation because its special black absorptive surface uniformly responds to most of the solar spectrum’s energy. The sensing element is usually enclosed inside one or two specialty glass domes that uniformly pass the radiation to the sensing element. The advantages of thermopile pyranometers relate to their broad usage and accuracy. A thermopile pyranometer’s black surface uniformly absorbs solar radiation across the short-wave solar spectrum from 0.285 to 2.800 µm (such as with the CMP6 Pyranometer). The uniform spectral response allows thermopile pyranometers to measure the following: reflected solar radiation, radiation within canopies or greenhouses, and albedo (reflected:incident) when two are deployed as an up-facing/down-facing pair. Although thermopile pyranometers can be the most accurate type of solar short-wave radiation sensors, they are typically significantly more expensive than silicon photocell pyranometers. Silicon photocell pyranometers produce a µA output current similar to how a solar panel converts the sun’s energy into electricity. When the current passes through a shunt resistor (for example, 100 ohm), it is converted to a voltage signal with a sensitivity of several µV/W/m2. A plastic diffuser is used to provide a uniform cosine response at varying sun angles. The spectral response of silicon photocell pyranometers is limited to just a portion of the solar spectrum from 0.4 to 1.1 µm. Although these pyranometers only sample a portion of the short-wave radiation, they are calibrated to provide an output similar to thermopile sensors under clear, sunny skies. 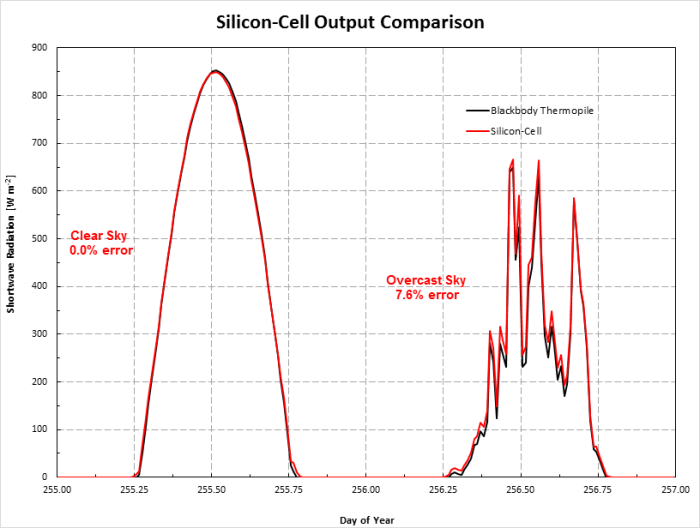 Silicon photocell pyranometers are often used in all sky conditions, but measurement errors are higher when clouds are present. The uniformity of the daylight spectrum under most sky conditions limits errors typically to less than ±3%, with maximum errors of ±10%. The error is usually positive under cloudy conditions. Silicon photocell pyranometers are typically several times less expensive than thermopile pyranometers. For environmental researchers, the accuracy of silicon photocell pyranometers is often sufficient for their requirements. The disadvantage of silicon photocell pyranometers is that their spectral response is limited to a smaller portion of the solar spectrum from 0.4 to 1.1 µm. These pyranometers perform their best when they are used to measure global solar radiation under the same clear sky conditions used to calibrate them. They should not be used within vegetation canopies or greenhouses, or to measure reflected radiation. Because the silicon-cell sensor is calibrated under sunny, clear-sky conditions, it closely matches the higher-end sensor in those conditions. However, because the silicon-cell sensor only subsamples solar short-wave radiation (0.4 to 1.1 µm), errors are introduced when the sky conditions change. This particular sensor reported a positive 8% difference from the reference on an overcast day. What are the different classes of pyranometers? The WMO (World Meteorological Organization) has established the World Radiometric Reference (WRR) as a “collective standard.” "The WRR is accepted as representing the physical units of total irradiance within 0.3 per cent (99 percent uncertainty of the measured value).” All pyranometer calibrations trace back to the WRR. Click the table for a larger image. There are a few differences in the WMO and ISO specifications. For example, the ISO standard for solar energy (ISO 9060) specifies a spectral range of .35 to 1.5 μm, whereas the WMO standard’s spectral range is 0.30 to 3.0 μm. In addition, the ISO secondary standard specifies 3% spectral sensitivity, whereas the WMO High Quality specifies a 2% spectral sensitivity. 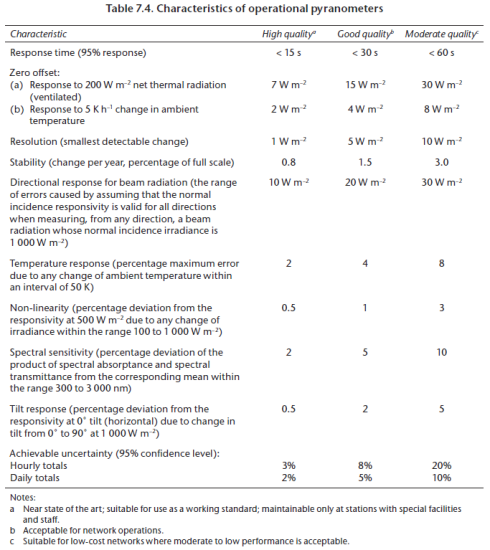 In the table image above, the WMO specifies “Resolution” and “Achievable uncertainty,” which are not mentioned in the ISO standard. I hope this introductory article has helped familiarize you with pyranometers and what they do. 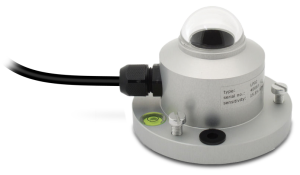 I also hope you have a better understanding as to the type of pyranometer that may be most suitable for your application’s needs. If you have any questions or comments about pyranometers, please post them below. Jarraud, M. “Guide to meteorological instruments and methods of observation (WMO-No. 8).” World Meteorological Organisation: Geneva, Switzerland (2014): 233. ISO 9060:1990 Solar energy — Specification and classification of instruments for measuring hemispherical solar and direct solar radiation, International Organization for Standardization, Geneva, Switzerland. Tanner, Bertrand D. “Automated weather stations.” Remote Sensing Reviews 5, no. 1 (1990): 73-98. Alan Hinckley is the Senior Market Sales Engineer for the Environmental Group at Campbell Scientific, Inc. He has a master's degree in biometeorology from Utah State University and a bachelor's degree in chemistry from New Mexico State University. ± 5 % at solar zenith angles of 45° and 75°, respectively. So Apogee have done the correction using the shape of the diffusor, but silicon photocell pyranometers still have a small error. We users don't have to do a math consine caculation, which is not see in CS300 manual. Am I right? PS: Your article is very useful! Your final statement is correct. You do not have to, and should not, mathematically apply a cosine correction to pyranometer data. The sensors have already done it for you. First, it is important to separate directional response, cosine response or cosine correction--all different names for the correction needed due to the angle of the radiation--from errors in that correction. Cosine correction is done by the manufacturer of the pyranometer so the pyranometer follows Lambert’s cosine law which states that radiant intensity is directly proportional to the cosine of the zenith angle. The directional response error or cosine correction error indicates how far off from a true cosine correction the sensor is. A common directional response specification for pyranometers is a deviation of less than 10 W/m2 from a direct beam of 1000 W/m2 up to a zenith angle of 80°. The cosine of 80° is 0.174, so irradiance from a 1000 W/m2 direct beam is 174 W/m2 at 80°. Thus, a pyranometer with this specification should measure within the range 164 to 184 W/m2 at a zenith angle of 80°. This specification can be interpreted in terms of relative error by dividing 10 W/m2 by 174 W/m2. Thus, an absolute error of 10 W/m2 at an 80° zenith angle is a relative error of 5.7%. If the directional error specification is 20 W/m2 up to 80°, then relative error at 80° is double that for 10 W/m2 (11.4 %). For a directional error specification of 5 W/m2, relative error is half that at 80° (2.9 %). Second, hoping to be interesting without going too deep, I would like to expand a bit more on similarities and differences between thermopile pyranometers and silicon-cell pyranometers and their effect on the cosine correction error. Thermopile pyranometer cosine correction is impacted by the spatial uniformity of the domes and blackbody absorber and the alignment of the domes and the absorber. Similarly, silicon-cell pyranometer diffusors must be uniform and properly aligned with the silicon absorber. All pyranometer-leveling devices must be on the same plane as the absorber and the sensor must be exactly level. The cosine response of silicon-cell pyranometers is different from thermopile pyranometers in that it also includes a spectral component due to the unique spectral response of silicon photocells mentioned in the article. For silicon-cell pyranometers, the cosine response in the field is a combination of the angular cosine response as measured in the laboratory and the spectral response of the sensor. At high solar zenith angles the angular response error is negative but the spectral response error is larger and positive. Consequently, silicon-cell pyranometers diffusors are shaped to increase the negative angular error to offset the positive spectral response error. Doing this, they can keep the total cosine response error under 5% at angles less than 75°. The essential point is that both glass domed thermopile pyranometers and silicon-cell pyranometers with diffusors output cosine corrected solar radiation measurements. It is just a bit more work for the manufacturer of the silicon-cell pyranometers due to silicon’s unique spectral response characteristics. j'ai trouvé votre article tres interessant. Actuellement je suis sur un projet d'etalonnage de pyranometre par cmparaison en exterieur ISO 9847, je voudrai savoir s'il y'a lieu de tenier compte de la temperature ambiante en externe dans le calcul de l'incertitude. Quel conseils pourrai vous me donner dans la mise en oeuvre de mon projet.